Aisha’s school class went on a field trip to the zoo last week. I was able to volunteer, so I accompanied them to the zoo and spent the day with them. Aisha was absolutely thrilled that I could go. We were planning on homeschooling this year, and she has been pretty disappointed by the change in plans, but is thrilled to have me available to volunteer. Here’s the thing about social anxiety and being the little sensitive soul that my Aisha is. It doesn’t matter what the activity is, how many of her friends are there, or what she is doing… she will still have down times and the need to be alone. She will need to be sad in a corner by herself somewhere, or in this case, in a kangaroo pouch. She may need to cry, and she may need a big hug. This is exactly why I wanted to homeschool her. So I could be with her more often, and help her navigate these feelings she has, particularly while in social situations or large groups. Whatever the case, we are not homeschooling, and we will make the best of what we have. 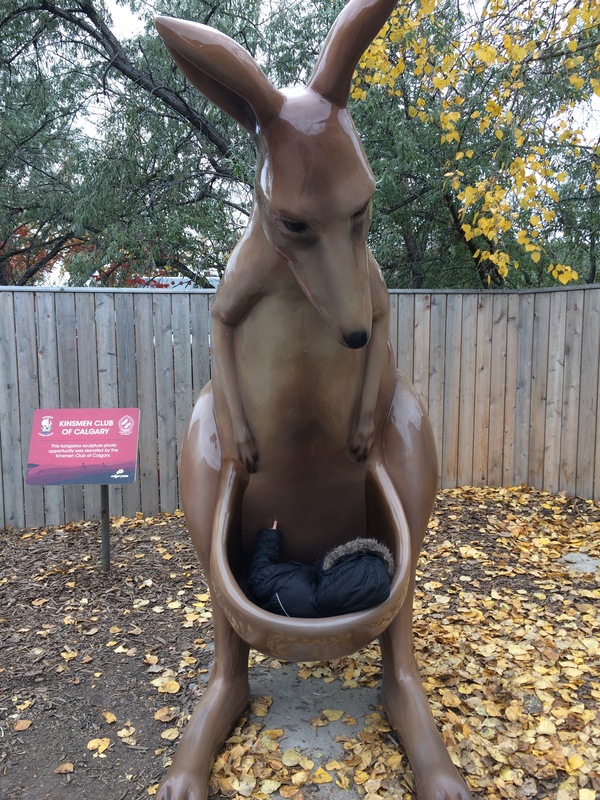 I am happy to be able to volunteer for all her field trips, as I’m not sure anyone else would have allowed her the space to cry in the kangaroo. I’m not sure they would understand her like I do, and she could potentially get written off as just a bratty kid who pouts when she doesn’t get her way. And now I’m feeling incredibly lucky to have a partner who shares the dayhome with me. Without Lindsay, I wouldn’t be able to do any of the volunteering I can do this year. Aisha really enjoyed getting as close to the animals as possible. She wanted to look them right in the eye. I explained that sometimes animals view that as aggressive, but she kinda has a way with animals so I didn’t coach her too much on it. She loves animals so much, and has such a deep respect for them. I love this about her. Aisha picked out her favourite plant in the conservatory and drew it for an assignment. Art is serious business for this kid. Overall, the zoo was a great field trip. We had a blast, and Aisha’s anxiety did not take over the entire day. She was pretty disappointed that the owl exhibit was closed, but other than that, it was a success.